Vienna imposes upon your eyes, a cityscape that weds beauty with a raw display of Enlightenment power. 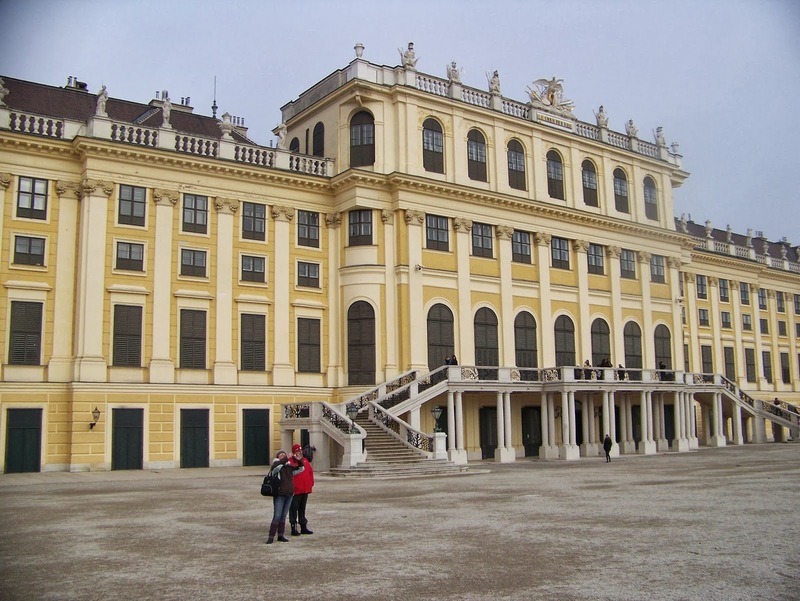 Its core architecture is all about the Hapsburgs, from the imposing buildings at the city center all the way out to the Schonbrunn Palace (see the photo), which is by far the most ostentatious private residence I can imagine. All to do with Austria's ruling family and their centuries-long display of manufactured majesty. Vienna is a city, then, nested in cities, with a lengthy history of spilling over its walls, then rebuilding walls to accommodate its growth. What this did in Vienna was transform a central city into a kind of warren, where alleys that are more tunnels than alleys open into squares small or grand, ringed by Italianate buildings, magnificent ones from the 18th and 19th centuries side by side will more approximate ones—reconstructions from Vienna's post-WWII salvage, when the housing need was great and the finances strapped, and yet the city's mind, still deeply conservative as Vienna almost always is, tended toward facsimiles of the older structures that were still standing, distinguishable from the older counterparts by a kind of inattention to detail and nuance, settling for living spaces over architecture because they had to, because the finery of the old things didn't make sense like it used to. And therein lies Vienna, dragged kicking and screaming into each century, embodiment of that simple but great conservative insight that moving forward leaves not only bad things behind but good ones. That the impossible family ego that accounts for the size of Schonbrunn and its rooms on rooms within rooms accounts also for the impossible grandeur and beauty of the place. I was thankful that the politics of post-war Vienna were so fluid and chaotic, so that Soviet architecture did not create a drab "workers' paradise" like the ones on the Budapest outskirts. Between and among its elegant older buildings and its well-intentioned but more pale restorations, Vienna lifts curtains and reveals itself like a graceful, aging, fairly decadent fan-dancer. The steeple of St. Stephen's (perhaps Vienna's central church) vaulted up into the darkness, half-obscured by December fog, impossible to photograph, as though it promised only a temporary glimpse into the past that shaped this city, as though the camera was only allowed to catch the play of light along its edges like an enormous and guttering torch in the night sky. At one time, no doubt, that steeple was introduced to a city skeptical of change; it was resisted, maligned according to standards of ugliness we would no longer recognize, then somehow the city grew accustomed to it. It is the way things were and are in Vienna, and I wonder what the inevitable objections were, but also what the church replaced in a city that changes so slowly, but changes nevertheless.